Christmas time is the time of fairy tales. Who does not think of the tale of Hänsel & Gretel? With our gingerbread house kit, you not only get the typical Christmas gingerbread smell, but also a lot of DIY fun home. The kit consists of different gingerbread plates. As a "cement" you can use the frosting, which you can optionally order and the color touch can be provided by 4x 10g food color in blue, red, yellow, and green and also the colorful sugar decoration. 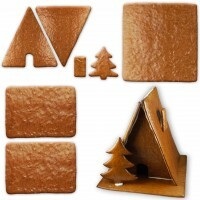 The crunchy cottage is built about 36x37x36cm and has a gross weight of about 2600g.